Polar bears congregate every year around Churchill, Manitoba to await ice formation in the western and southern Hudson Bay. By early to mid November, polar bears are omnipresent in the Churchill Wildlife Management Area with travelers on polar rovers seeing more than 50 polar bears in a single excursion to the tundra. 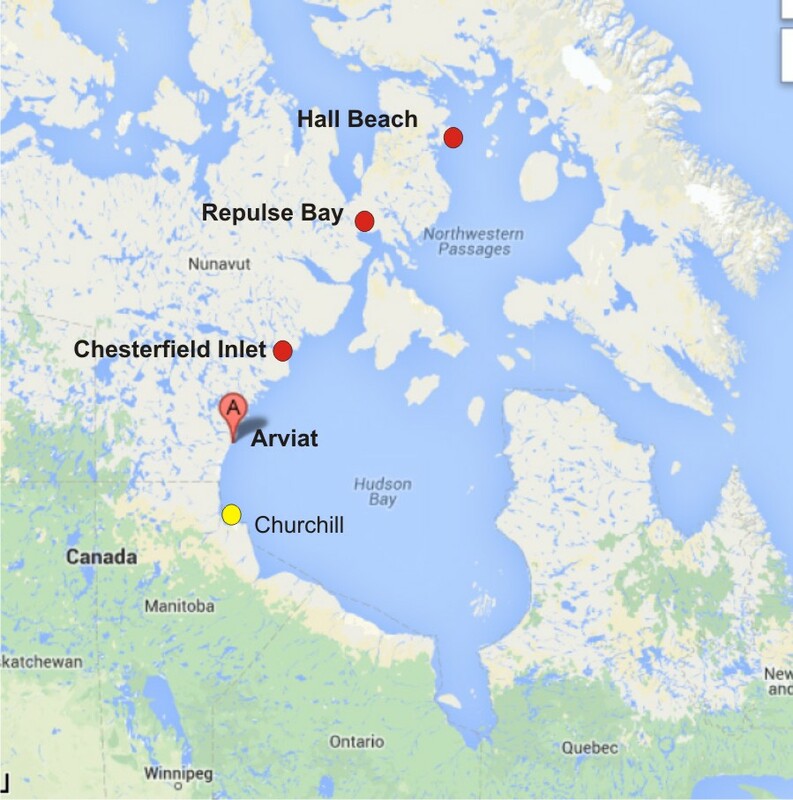 There are a few major factors for the bears anticipating the freeze-up in the Churchill region.First and foremost is simple topography relating to the location of the town of Churchill and the jutting land that extends into the bay known as Cape Churchill. As you can see by the map the shelf is quite evident. While this shelf extension is not all that crucial in itself as a major congregating hot-spot, the contributing factors qualify it as such. Counter-clockwise sea currents cause ice formation to get hung up there. The stalling affect on the flow of water coupled with fresh water flow from the Churchill and Nelson Rivers, to name two of the biggest in the area, create the perfect formula for ice formation here. Since fresh water freezes faster than salt water, the ice will build early off the coast and then combine with the northern ice formed in the colder regions. That pack ice is pushed in by the currents and south winds. All this make for a “perfect storm” of ice formation at the most accessible place in the sub-Arctic. Three polar bears explore the coastline anticipating the freeze-up. Karen Walker photo. Of course, there is another reason polar bears like Churchill. Human population. A community of humans brings all the side benefits for animals…and in this case hungry polar bears trying to survive to the next seal-hunting season on fat reserves. The aromas and food by-products associated with human life attract every opportunistic species around. Around Churchill, top of the list are the polar bears. Before the old dump was closed down some years ago, polar bears would forage there all day and became a zoo-like attraction to travelers and locals alike. With the majority of that facility closed down, polar bear activity in town escalated over the years. The Polar Bear Alert program has become quite active in attempts to keep up with the burgeoning polar bear appearances in the town. Polar bear holding compound in Churchill. Global warming indications have also caused polar bears to appear on land earlier in the summer months. With sea ice coverage decreasing recently in the Hudson Bay, polar bears are being forced to come on land and seek alternative food sources. I can say from first-hand experience that polar bear sightings in Churchill have increased over the past 15 years. Guiding summer beluga whale trips for over a decade has allowed me to witness the firsthand increase in bear numbers. Bears have also become more successful at seal hunting in the shallow tidal coastal areas around the Churchill region. Overall, the changes in polar bear numbers year-round have spurred Manitoba Conservation officers to adjust their strategy regarding bear management in Churchill. The feeling is this will continue to be readjusted even more over the coming years.